For people living with misaligned, crooked, gapped or crowded teeth, braces in Bethel Park provide the most effective way of correcting their bite. What should be expected, though, throughout the treatment process? A local orthodontist answers that and other frequently-asked questions so you can plan accordingly and prepare to enjoy a beautiful new smile! Brackets – The process starts with metal brackets being bonded to the teeth using dental cement. Considered as the anchor, the brackets allow for the arch wire and bands to be securely placed. Arch Wire – For each set of teeth, your orthodontist will place an arch wire, which is responsible for applying the necessary tension for your teeth to move. Every four weeks, you’ll visit for an adjustment and to have your progress monitored. Bands – The last components are the bands. Woven into each bracket, their purpose is to hold the arch wire in its place. 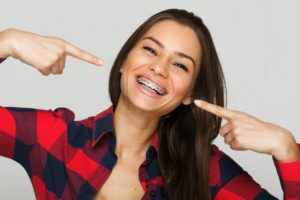 While there is no denying the effectiveness of wearing braces, you’d still like to know what to expect from the process. Here are answers to some commonly asked questions about the treatment experience. Question #1 – Do braces hurt? It’s normal to have some soreness within the first week of having braces placed. The good news is the discomfort should diminish as your teeth adjust to the tension. However, if there is continuous pain, you should bring it to your orthodontist’s attention. Question #2 – Are there any food restrictions? For the process to be successful, you’ll need to abstain from eating sticky, brittle or sharp-edged foods. Otherwise, they could break the wire or cause a bracket to dislodge. Question #3 – How should I clean my teeth? Wearing braces requires some slight changes in your oral hygiene regimen. First, it’s a good idea to have your teeth cleaned before undergoing the process. Then, after the appliances are placed, you can use a toothbrush and floss specially-designed for cleaning teeth with braces. Question #4 – How long will I have to wear my braces? Each treatment protocol is unique to the patient’s needs. So for an accurate determination of what the duration of your treatment will be, you’ll need to visit your orthodontist for an examination. While it may seem cliché, it’s important not to forgo happiness. So if you’ve been living with a smile that you’re not proud of, then it’s worth your time to visit an orthodontist in Bethel Park for a consultation. Before you know it, your treatment will be done, and you’ll have the smile of your dreams! For over 20 years, Dr. Gary Cartwright has been providing top-notch orthodontic care. The University of Pittsburgh graduate received his degree in orthodontics from the University of New York, Stoney Brook. Dr. Cartwright would later be awarded his Board Certification from the American Board of Orthodontics. He creates beautiful new smiles by placing braces at Cartwright Orthodontics, and he can be reached for more information through his website.